Write-up of the Special telecast of GuruPurnima Event in Mumbai and Lucknow. Babaji spoke a great deal about the guru-disciple relationship and shared some of his experiences on this occasion, which he rarely does. As usual, all the words here are in direct speech, meaning whatever "I" you see below is Babaji's words. In bracket is what I have added to add a little clarity in my conveying of what was taken down from the TV telecast. It is becoming overwhelmingly important to note that Babaji is sharing a lot of things which he never did before, some things I assume Siddhas do only when the time is right. It thus becomes important to catch the message behind ever word of our guru and put it into act. In this episode it was quite evident that things happen with the unison of the entire guru mandala who are helping us out in some or the other way. Babaji emphasized in this message that no one is alone and there is constant support available at all times, provided we learn how to tap it and connect to it. Again, Babaji has emphasized the utter importance of learning to connect to him and trusting the process. All Babaj's precious gems recorded here in this blog are no doubt precious but here comes a message as a reminder to all those gems and as a reminder to focus on advait sadhana, completely on nonduality. Babaji has put more attention on this point during this common message. It would be rewarding if one takes time to read through these points and stop to contemplate on them, which can help these important messages pierces deep into the soul. Namah Shivaya. My guru said, "Whoever comes to you, do not see what they have to say or what they do, see the intentions behind them as the bhaav is important. Bhaav is the energy. So see the energy and everything will be seen." The first thing that spirituality teaches is to become a human. It awakens the consciousness within. As you begin the inner journey the granthis (knots) open. Second is unconditional love; how much you give is more important that how much you receive. Giving love to your family itself with speed up your spiritual progress. Wipe the tears of others, help others and bring smiles on other's face and everything starts changing. If the words that come out of your mouth motivates someone and brings peace and happiness to someone, you have earned punya (merits). If anyone hears your words and feels sad you have earned a paap (demerit or sin) and if someone is hurt and cries after listening to your words then you have created a mahapaap (grave demerit or grave sin). Bring out the God/Shiva in you. You will have to help humanity to move towards the brighter side. As purification starts happening you start thinking not from the mind but the heart. You are connected to me but even I am connected to someone (Babaji points his finger above) I am connected to the guru mandala. So they are also sending their grace to you through me. I saw that whichever home my guru went, it brought happiness, wealth, health and prosperity. What a person is, he gives it to everybody around. You can give only what you have. You can give happiness only if you are happiness. Make yourself so pure that not only your life changes but your mere presence itself make the lives of people around change. Same way, one who is negative is connected to bad energies, and first his life breaks down and then wherever he/she goes he/she keeps destroying everything around. A guru does not need to go anywhere; you just need to connect to him and call him. Once you make one your guru, he will not leave you. A guru does not make disciples. Once you accept a guru then there is no worldly formalities or rituals. No garland, no shawls - these are all symbolic. A teacher will teach and make thesis and maps. A guru will reveal to you that everything is within you and to move away the clouds of ignorance and illusion. You keep doing sadhana and keep merging with the infinite and one day when all karmas will burn away and this day you will know that there is no merging but you yourself are the infinite. The 'you' will emerge infinite. My guru gave me the grace and mantra when I was very young but he did not teach me any method but only gave the mantra. I remember he asked me to get a book and I had put it down in a small red book. 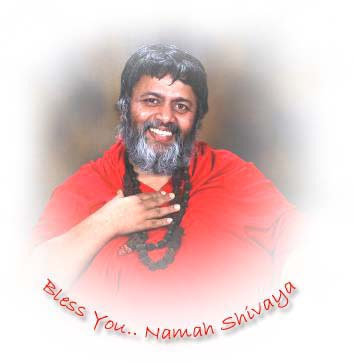 He then went away and then onwards, i just sat for sadhana whenever possible and I was able to only due to his grace. One day when all the people in our haveli (mansion) had gone out and I was alone doing my sadhana, suddenly I saw myself (physical body) sitting on the asana. I was surprised to this. Then I started to move left and right of the body. Then I realized that the "real I" was out and it was the physical body that was sitting. I got this wisdom that I am giving you that this "I" is not this body. "I" see, hear and talk through this body. I am not this body I am the soul.. Shivohum.. I am Shiva. I used to sing this but it took lot of time to realize this fact. Being a little scared, I thought I will move around the room, and I started moving around the room. Initially, I was anxious about all this but soon it started happening with I sat for sadhana. Then I met my guru out of this body who told me a lot of things. I asked him, "You could have told me all this earlier why now?" He said, "Whatever I could tell you in this body I told you. Now that you have come out of it, I will tell you and will take you and start your further journey." And the journey started. "When you are with this body, you will be attached to ego, greed, and anger. Now you have passed a test and moved ahead and now I'll give you further wisdom." Then one day he said he will not come any further. I was scared and asked him why and he said, "Our journey together was only till here and from here whoever is yours till the end will come." I asked him, "Why didn't your come earlier then and if you had to leave now, why did you ever come? Now, when I have got attached to you, you say you are going? "He said, "You could not have heard me or seen me then when you were in your body and you could reach me only when you were prepared and after that only it was possible." I used to never understand a single way of any siddhas but there was respect and faith. My guru told me, "Do not mention these things to all and whatever is happening let it happen and you should continue doing my worldly karmas, otherwise you can get distracted and the karmas that you are supposed to do will remain pending." My guru also said not to use spiritual powers to overcome obstacles but to keep witnessing them though my karmas. After my guru went I could not see him again and I searched for him everywhere and even in Kumbh mela because that is a place where all saints and gurus come but I could not find him there. Finally, disheartened I sat down for ugra (intensive/powerful) shakti sadhana which later became soumya (soft). When you give, enjoy the feeling of giving and don't wait to get something back. Whatever I am telling you is all within you. Do not run here and there in superstition. In between the below narration Babaji asked everyone to close their eyes and take this message as he is giving everyone this important message....Then I got the Shiv mantra deeksha from Baba (Sai baba) and I started doing shiv sadhana. Then I was asked to do intense sadhana (day and night) and I thought night is supposed to be sleeping time. One night, as I slept the whole room started turning upside down and I got up and was scared. My asana was lying ahead of me in a distance and I moved towards it with great effort amongst the tumbling. When I reached the asana everything suddenly came back to normal. But the moment I let my asana everything again shook up. I realized that this was an indicated to do sadhana. I had to choose a regular time/regular place (Yama-Niyam). I learned things the hard way. Then, at 6 p.m. I used to automatically go into the shambhavi mudra (eyes rolled upwards to the third eye) and this would happen at any place. Then, onwards the moment it was to be 6 p.m. I used to run to search for a location to sit down. (Babaji stressed here on following discipline of Yama-Niyama) I am lucky that my guru was tough and is a tough guru. The last mantra of my sadhana that my guru gave me was "Aapko dhyao aapko bhajo." (meditate on yourself and worship yourself) aap mein aapke Ram aap hokar rehthe hain. (in you, your God, becomes you). I did not know what it meant. Then I kept Bhole baba in front on me and again he came and said the same mantra "Aapko dhyao.....". I released many things during my sadhana. That is what I say to you , the same message, that you may say you understand this but this will purify you and can also bring a lot of ego in you. A ShivYogi is a pure person who will definitely understand this and go ahead in sadhana. This is my message to you, a beautiful thing which he gave me. Advait sadhana which siddhas did, closing their eyes and getting into samadhi - see yourself. When I saw myself I felt good, felt peace, wherever stress was there it got released. I said to myself this was good. But as I continued I started seeing dirty and fearful faces and fearful visions. I was scared and opened my eyes. Then I meditated on my guru and again his voice came in "Aapko dhyao aapko bhajo" and then I realized all the hidden sanskaras (psychic impressions) hidden within me were starting to emerge and Prati Prasav started happening. The base of the sushumna started opening. All lower chakras started opening up. Ignorance started fading away. After that all the fearful and bad visions stopped and then started good visions. Seeing them all, I then started seeing saints, sadhus, ashrams, good deeds, bhandaras (blessed food/meals/feast) and pleasant people. One day I opened my eyes in fright. When I closed my eyes I now started seeing my guru in place of me. I reached the paramanand state. I started getting the feeling of paropkaar (doing good or service to others). My worldly behavior changed. Whenever I closed my eyes, I saw my guru. Then I wisdom dawned upon me that whatever sanskaaras were there in my sushumna from thousand of previous lives were all gone one by one. When the mind purified and became one with the guru and when shambhavi was activated in my sight, and when my guru said "Aapko dhyao ......." and when my attention was only on myself my mind all impurities came out of myself and released. The bad visions were from my own karma, through so many lifetimes that this soul must have been through, all those tamoguni karmas were in the base of the sushumna, and they were released. After that all the vaibhav (riches/prosperity) that I had experienced and all the ego that was associated with it and all the praised I experienced from the world were also in the form of rajoguni karmas in the sushumna. Then the grace of guru " "Aapko dhyao ......." worked on me. Till the time there is the "I" and falling at feet, this also is a sanskaar. The day the "bodyness" or "I'ness" or the "name" disappears that day there will be no sanskaras. When the desire to bring the self's name ahead then sanskaras will leave - the rajoguni karmas in the base of the sushumna, the tamoguni karmas in the center of the sushumna and satoguni karmas in the upper part of the sushumna. When these are released with the grace of the guru then there will be guru's darshan (vision). Experience the world with the body that has been born to experience it but also keep in mind that it is all mithya (temporary/false/illusion). You have not come in this world to take but to give to the world. Who desires to take from the world will always find sorrow and those who only intend to give they will remain happy always. If at all you want to take, take from the Guru, take from Shiva. Guru comes to give grace but not make disciples but he waits when the disciple will make him his guru. You don't get infinite with dvait (duality) sadhana - meditate on the self. It might give you some progress with some goodness but will not make you infinite. With Dvait (duality) Sadhana you will not get anything, maybe you will get some of the worlds riches but you will not get the infinite. "Main hi upasak hoon aur main hi upasya." (I am the worshiper and I am the object of worship.) Do not search outside. Infinite is inside. I know it takes time; it took time for me also. You also meditate on your self and then see me me with your own self. The day your purification happens that day you will see your guru within you. That time you will not be there only HE will be there. You will experience SHIVA. That time you will not be there only SHIVA will be there. That one who cannot be born and cannot die. It is you itself. Even if halahal vish (poison) comes out let the manthan (churning) go on. If riches come out don't run madly behind it neither discard it, let it happen. Then in the end amrit (nectar) will come out and then you drink the nectar and you will become immortal - the final ascension - the freedom for the cycle of birth and death - freedom from desires. Aapko dhyao aapko bhajo.... This applies in worldliness too. Don't say, "I took this mantra from Babaji but look at what others are doing?" I will still say, "Aapko dhyao, unko kyo dhya rahe ho?" Meditate on yourself only. 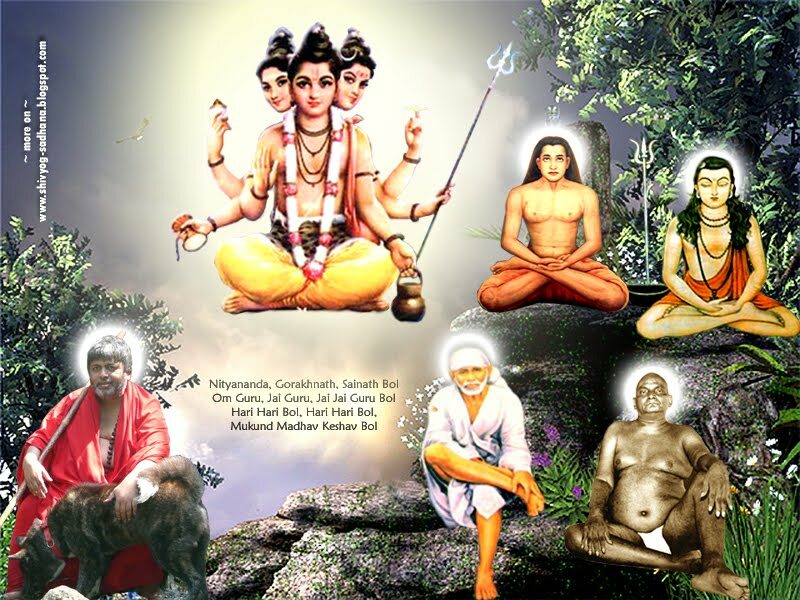 On gurupurnima, Shiva and Shakti are prominent everywhere because you are connected to your guru and your guru is connected to his guru and thus you are all connected to the guru mandala - connected to Baba Nityananda, Baba Gorakhnath, Mahavtar Baba, Bhagwan Sai nath and so and so you are connected with the guru of gurus Bhagwan Dattatreya, who is again connected to Dakshinamurty Bhagwan Shiva and Bhagwati is connected with Shiva. So those who are connected today can never have scarcity in their lives. The shakti comes through Siddhaloka and reaches you. I have often told this and I again repeat. Do not ever think that you are alone. Whoever has a guru can never be alone because who has a guru, he joins you to all gods and if you are a sadhak then Bhagwan Datta becomes obliged. Bhole baba becomes obliged to those who remove the "I" ness and if you are in trouble and if you cannot reach to Lord Shiva, the guru will bring Shiva to you. I am talking nothing but the truth - Never feel helpless. Call once and see. How many times have you called Shiva or called the guru when you are in trouble. Do you call or keep brooding over the problem. If you have any problem any life or body close your eyes and call Baba and he will be there. Telephones messages come asking Baba to heal and then a reminder comes again enquiring if it has been told to Baba or not. He will call, BUT ARE YOU CALLING? You are still with the phone. There is no requirement of the phone. Understand! Who can reach you to heal you, does he require to listen to a phone call? Close your eyes and call Baba to come and heal and mention your problem and be receptive to healing. Then don't run around. Connect your 10 mins, 15 mins, 20 mins and call and see. Ask and see and if the problem does not go away slowly or if you don't get any solutions, then you can say 'Babaji you have not done anything.' Today is Gurupurnima day and so I am telling you this. Make your body fit first with Yoga, pranayam and exercise because this is your first door to reach to the last step. Tulsidasji said, "Bade bhaag manushya tan paava." (Very fortunate to receive a human body) If there is no body then you cannot sit to do sadhana. You need it first. Make niyam (observances). So many asanas, so many pranayam, so much of yoga. Channel all your energies to one point, not scattered in different directions. Drink tea, read newspapers, surf TV channels (Babaji mocked about the sensational news programs) What have you to do with all these things? Tum chahthe kya ho? Do you want to see what is sensational there or transform your life? If you channel all your energies to one focus, then you will succeed in life. First be a human then spiritual. Foremost is feeling of unconditional love and care. Go home and sing "Aa chal ke tujhe...."
You have karmic connections with your family. If someone is unhappy help that person out. It is your responsibility to take off their sorrow. No big things to do here, just say "I care for you.. I love you." When I used to do my guru used to ask me "If someone gets angry with you or throw tantrums or do some mistake in front of you, what will you do? I said that I will take to task. Then my guru said, "You are not yet ripe, do more sadhana." Then he asked, "If you children are getting sick and are shouting what will you do?" I said that I would make them understand and my guru's answer was the same. Then doing my sadhana when I understood who I am, then when the same question was asked I replied, "I will give them love". The sun only gives sunlight, mother ganga gives only water, mango tree gives mangoes and not tamarind. What it is, it gives. I am the unconditional love, so just give love. After this I saw that all my tasks started happening. Because who is in sorrow, he only is shouting. So how will you give peace? By just giving love. Shouting, scaring and counseling is not needed. So when children do all this - just give love. Then they will become your friends and start understanding you. To all sadhaks - To get progress in sadhana do everything unconditionally. We always do something to get something. Even same in sadhana, if you change our bhaav (intentions) and instead of focusing on receiving if you focus more on giving, then you will even get more. What my guru taught me in the most simplest way I am teaching you. When he told me this first I never understood it but realized it the day when I realized my "self" and when you realize your "self" you will understand that there is nothing to take because whatever you want to take is within you itself. When I realized I was getting everything from myself then all that I was seeking now was purification, rest all is within me. Why do blockages happen in sadhana? It is because of the receiving and attracting attitude. If I only think of giving in sadhana, all doors will open and flow will increase and the grace of Shiva will increase and you will move ahead. Babaji sang the beautiful song that is in this picture of the Guru Mandala. A ShivYog sadhak from Mysore - Gayatri di was kind enough to record the MP3 version of this very important telecast. Many many thanks to her! It was recorded through an external device so it also does contain momentary faint background voices of her little angel son - Supratik. But in any way, it does not disturb the voice quality from Babaji. So, until any videos (if any) comes up you may want to relish these audios. u r do very thankful job by writing these articles. i request u, please make another blog in hindi also. Thank you Kapil. You can use the translator on this blog to convert english text to hindi and read it. Namah shivaya. Thank you jacobji for ur awesome and wonderful presentation . god bless u .